Greetings! I haven’t written any recipes in over a month but if you’ve been reading my blog for a while, you may have noticed that I tend to write less when I’m busy with school. In addition to being a full-time grad student, I also started a new job in september as a nutritionist! All of my work seems to be paying off and it’s a great feeling. I’m a big believer in occasionally celebrating achievements with healthy baked goods. I’m also a big fan of local produce. 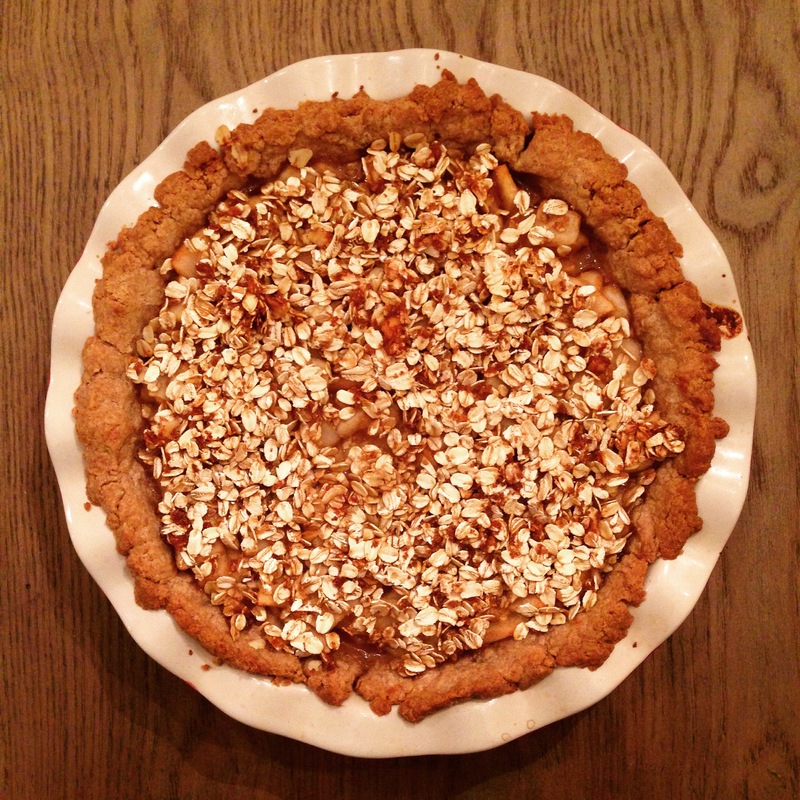 Combine these two you get my latest recipe: Healthy-ish Oat Pear Pie. I’m calling this recipe “healthy-ish” because pie isn’t the healthiest food in general, but I did make a healthier version of pie by using whole wheat flour and less (vegan) butter than found in some recipes. Measure and mix dry ingredients. Melt the butter and add into the dry ingredients, mix well. Add the nondairy or regular milk along with the cold water into the mixture, slowly. If the mixture becomes too moist, add a little more flour by the tablespoon. Set aside and refrigerate for 30 minutes to an hour. After time has elapsed, spray a round pie pan/tin with nonstick spray. You can either roll out the dough using a rolling pin coated in flour so that the dough can easily be placed and spread into the pie pan OR you can use your hands to transfer the dough to the pan and mush it into the pan so that it is completely covered on all sides (I used the second method). Add any extra dough to the upper sides of the pan to create a thicker crust. Peel, core, and cut the pears. Pears should be cut into small pieces, but not diced. Place the pears in a large bowl, and add the maple syrup, honey, sugar, lemon juice, and stir in the cornstarch so that it dissolves into the liquid. Mix well. Add the cinnamon and mix. Transfer the filling into the pie crust that lines the pie pan. Sprinkle oats and brown sugar on top of the filling. Preheat the oven at 375°F. Bake for 40-50 minutes, until the edges of the crust are browned and a knife can be inserted cleanly into the center of the crust. Remove from the oven after baking and allow to cool before cutting. Serve with ice cream, soy ice cream, sorbet, or hot cider. As always, enjoy!